Flaxseed is rich in fiber, phytochemical lignans, and most of all, it’s a great source of omega-3 fatty acids, next to fishes. 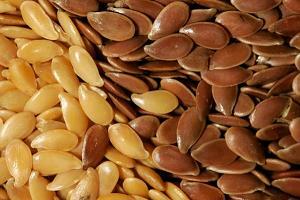 How does flaxseed benefit us? 1. Just like any other foods that are rich in omega-3 fatty acids, the omega-3 fatty acids are known to decrease heart disease risk by lowering cholesterol and blood pressure. 2. The fiber content in your meal that has flaxseed makes you feel full longer, decreasing your likelihood to overeat. 3. Phytochemical lignans of flaxseed give you heart protection from cancer. Whether you eat fish or not, if you like to add flaxseed to your diet, aim for adding 1 teaspoon of flax oil to your diet each day or 1 tablespoon of milled flax. wise decisions. Healthy eaters are always aware of what they eat, and know the effect that it will have on their bodies. your brain regularly with enough food to keep both your mind and body strong and alert. different types of foods, not limiting themselves to one specific food type or food group.